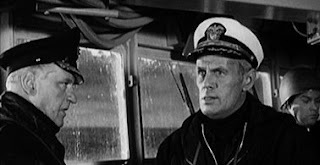 In this 1965 Cold War thriller, the devil is definitely in the strategic military details, especially when it comes to understanding the commander of the USS Bedford, a destroyer patrolling the North Atlantic Ocean. By observing Captain Eric Finlander (Richard Widmark), one can see by his actions and words what makes a successful military man, and also a dangerous one. The movie is shot in black and white, but this ship’s leader lives in a strategic gray zone where difficult decisions can lead to destructive consequences. 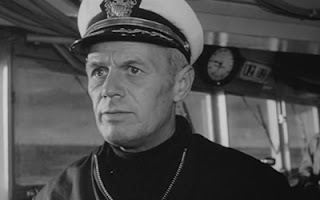 The Captain’s name implies a primal Scandinavian (Leif Erickson, Erik the Red) sailor who now appropriately navigates the frigid waters of his ancestors. Even though Finlander is an example of a primal military warrior, the tools that this 20th century soldier uses are very modern. He employs state-of-the-art technology to track movements of ships and weather balloons to determine origins and destinations of craft activities. He uses scientific analysis (one of the scientists is played in an early role by Donald Sutherland) to even analyze the garbage found in the water to determine if the food waste derives from a Russian diet. The vessel he hunts is appropriately named “Big Red,” (no relation to Erik the Red, but sort of ironic) a communist Russian submarine. The underwater vessel is a good symbol for a psychological theme, since it implies what motivations and drives lie beneath the surface of a character’s facade. In this case, the submarine symbolizes Finlander’s baser desires to hunt and destroy (thus it is appropriate that the skipper commands a destroyer, which is Finlander’s occupation). 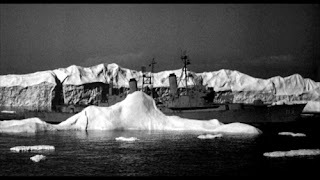 The Captain is intently focused in his pursuit of the Russian submarine, bringing to mind Captain Ahab and his obsession with the white whale, where the killing of the beast is really a self-destructive act of killing that dark aspect of oneself. 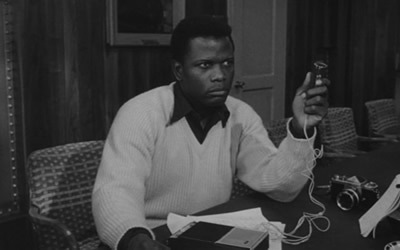 Finlander’s demonstrates his arrogance and impatience in the way he treats Munceford. 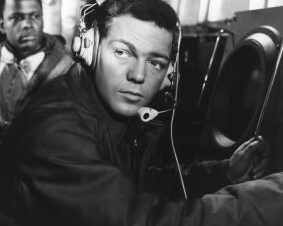 The journalist persuades one of the crew to let him see some tactical maneuvers. The Captain puts the seaman on report. 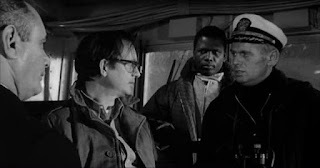 When Munceford tries to help the young man, Finlander shuts him down, emphasizing his power by saying that Munceford will not interfere with how he handles his crew members. 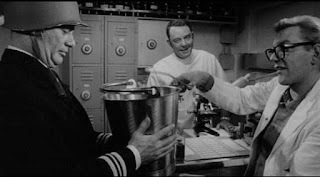 The Captain also cuts Munceford off, and shows his control over freedom of the press on his ship, when he stops the reporter from taking pictures with a curt, “not now.” At a briefing, he tells the journalist that he can take notes, and when he doesn’t, the captain gives a double-take look as if to suggest that Munceford’s refusal was an act of insubordination, refusing to obey the order of a superior officer. Finlander dodges the reporter’s question about the possibility of attacking the sub, and shows how little he cares for the press when he says that the world is at peace, “your magazine says so.” But, for the Captain, who in his mind has the paramount responsibility of defending his country from an enemy he encounters every day in a ship made for battle, no such peace exists even if the current war is called “cold.” Finlander appears agitated and defensive when Munceford pushes him about the possibility of not getting promoted being due to the Captain’s wanting to use more force during the Cuban Missile Crisis. He says he is prepared to “go all the way” to protect his country from its enemies. When Munceford asks if that means he would use nuclear weapons, he does not admit to that scenario, but he makes it known that he sees political diplomacy as a vulnerability. 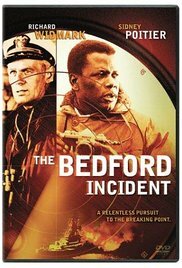 The Captain has the crew wound up to the point that even Munceford admits he is as ratcheted up in anticipation of what will happen next in the quest for the enemy. When speaking to the Commodore, Munceford likens the heightened zealousness to what Hitler created in Nazi Germany. Finlander constantly sounds “General Quarters” which means the crew seems to be perpetually on alert. He is loudly critical of any man who does not meet his high standards. 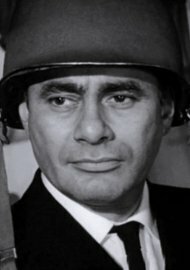 In fact, he humiliates the new ship physician, Dr. Chester Potter (Martin Balsam) for being a failure in his private practice and his marriages, seeking escape in active duty. 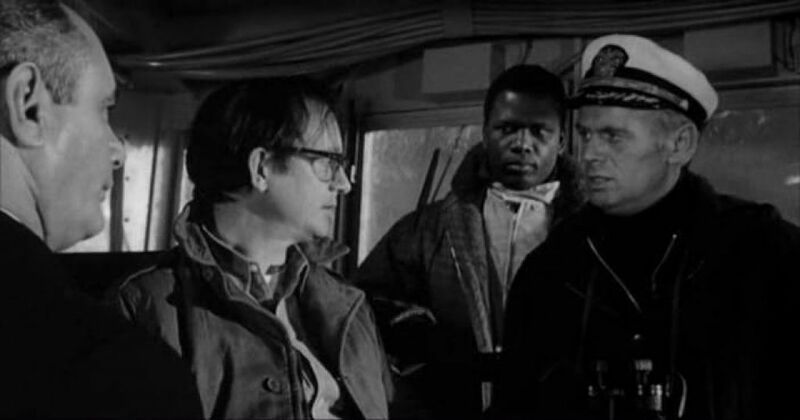 When the doctor says he will ask for a transfer since he did not specifically request duty on the Bedford, the captain says condescendingly that Potter, “didn’t aim too high” because he knew he couldn’t meet the ship’s level of achievement. Nobody shows up for sick call on the Bedford for fear of appearing substandard. Finlander didn’t even want a replacement for the doctor that left, which shows how his crew’s commitment to the military cause transcends personal ills. Potter says to Munceford that it’s unnatural for a crew to never relax and joke around. At one point Finlander shows his concern for a crew member, Seaman Merlin Queffle (Wally Cox), the nerdy sonar expert (the name suggesting Merlin the Magician?). The Captain tells him to rest up and take a break. But, Queffle refuses, because Finlander’s fervor has taken on a life of its own, and even he can’t reign it in. The skipper reverses this compassion in the heat of the chase when Queffle suffers a breakdown under pressure. Finlander refuses to accept Potter’s diagnosis, and says he wants the sonar expert back on duty soon, and not doped up on medication. The Commodore’s fears soon become justified. When Big Red surfaces enough to use its snorkel to acquire air, Finlander orders his ship to cross over the submarine to intimidate it. But he has pushed things too far, too close to the edge of hostility. The Bedford runs over the snorkel. 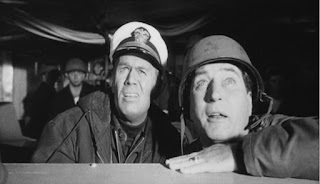 Finlander now readies for retaliation and orders Ralston to arm the rocket-propelled torpedo weapons. The Commodore pleads with the Captain to stand down. Finlander says, “The Bedford’ll never fire first. But, if he fires on, I’ll fire one.” Ralston, wound up like the mainspring of a deadly explosive device, hears the skipper’s words as a command and launches the rocket while saying, “Fire one!” The Captain tries to disarm the weapons, but fails. The Russian submarine is destroyed. But, as a last defensive act, the sub fired nuclear torpedoes at the Bedford. Munceford yells at the devastated Finlander, demanding that there must be some contingency plan for what has happened. But, the Captain has none. It appears he never considered not winning, and now seems reconciled to the eye-for-an eye resolution of the situation. The Bedford is engulfed in a mushroom cloud. Since the beginning of the modern age where technology facilitates the very real threat of mass destruction, it becomes extremely difficult not to overcompensate by using dangerous tactics to prevent devastating attacks. This film is a cautionary tale about the danger of becoming too much like the enemy one fears. The next film is Suspicion.